U.S. Chemical Storage discusses proper pesticide storage containment laws in Iowa and how to compliantly handle and store pesticide storage. While this document may cover a number of important compliant pesticide storage solutions, it cannot address every single situation for keeping pesticide storage maintained and compliant. For a full list of Iowa pesticide storage regulations, refer to your state’s requirements, such as the Iowa Department of Agriculture for total coverage of regulations and safety laws. Onsite containment of pesticides in Iowa: Bulk pesticide storage containers must be located inside a watertight secondary containment facility, completely sealed. Mixing, dispensing or transporting pesticides from one container to another must be performed at a permanent pesticide storage and mixing facility, within a compliant containment area. In order to create 100% compliance, Iowa pesticide regulations call for pesticide storage buildings to be leveled and elevated with either asphalt or concrete. This prevents runoff from surrounding areas that could potentially contaminate inventory inside the pesticide storage facility or even contaminate groundwater with a hazardous spill or leak. New Sites: A new permanent storage or mixing site shall be approved by the Iowa Department of National Resources. New permanent pesticide storage and mixing locations must be located at an equal distance or greater than 400 feet from public water supply wells or below ground level water storage and a minimum of 150 feet from private supplied water wells. When repackaging, mixing and transferring, Iowa pesticide regulations call for prevention of “unreasonable adverse effects to humans or to the environment”, stated by Iowa’s Department of Agriculture. Drainage, including washing and minor spills shall be monitored and properly managed. It is under the Iowa pesticide storage regulations that all pesticide handling units must be furnished with personal protective equipment, as required by specific pesticide labels. Mixing and transferring of pesticides as well as the rinsing of equipment is not allowed on public highways, roads and streets. For turf and agricultural professionals, the TURFLoc pesticide storage building is perfect for storing large volumes to small volumes of pesticide inventory. Professionally manufactured and continuously welded using 12 gauge steel right here in USA. Pesticide storage containers by US Chemical Storage offers superior strength to withstand extreme weather conditions for outdoor storage. 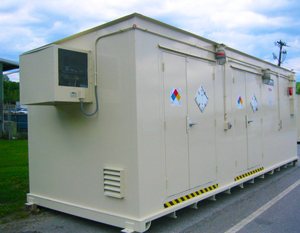 Customize your pesticide storage container to match your exact specifications with exhaust systems, mechanical ventilation, temperature controls, alarms, shelving and more. Meets and exceeds all NFPA, OSHA, EPA and FM approvals and Warnock Hersey standards.